So far I have read one chapter of this book. This book has super riddles that will blow your mind. Some of these riddles are so hard that people cant possibly solve them without help. This book even has some tricks that you can try and that will blow your mind and even shock you. This book can make you say I want to try that and see if I get it. 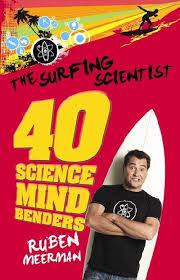 This book could be the best science mind benders book you have ever read in your life. Books,Books,Books right at the moment I am reading the snowy tower and right at the moment I am just up to chapter two and in the first chapter a lot of adventure and mysterious events have occurred. The book is a adventurous and mysterious book that will make you blow your head off because it grabs you straight away as soon as you read the first sentence you will want to read more of the book. I recommend this book to ages 11 and up because this book has great vocab such as ' swept into the palace library' and it will make you love this book like your under its spell .You can find this book at your local library now!